Seek To Know The Truth: How Does Your Church Counsel? How does your church provide counsel for its fellowship? That’s a critical question for the body of Christ. The answer ought to be “God’s way.” Yet for more than half a century, due primarily to the influence of so-called Christian psychology, the church, with rare exceptions, has been counseling man’s way in one form or another. The consequence has been that many believers have little more success in overcoming sins that are related to problems of living than do unbelievers. Indeed, even when the flesh is well-meaning—it profits nothing. Jesus declared, “I am come that they might have life, and that they might have it more abundantly” (John:10:10), but this lack of success would seem to deny His words. Furthermore, looking to worldly sources for help in sin-related mental, emotional, and behavioral problems is a rejection of the authority and the sufficiency of God’s Word. ). “For the word of God is quick, and powerful , and sharper than any two-edged sword, piercing even to the dividing asunder of soul and spirit, and of the joints and marrow, and is a discerner of the thoughts and intents of the heart” (Hebrews:4:12). So, the body of Christ has at its disposal the teachings of God’s Word, the empowerment of the Word itself, and the enablement of the Holy Spirit to carry out its instructions. Why then would believers turn elsewhere? That’s what every Christian, especially every church leader, those who shepherd the sheep, must consider. More often than not, even among fellowships that consider themselves to be biblical, the counseling techniques they use have little to do with scriptural teachings; instead they favor the methods with which the psychologized world has been mesmerized. My hope in this article is that believers in Christ, especially those in leadership, will evaluate biblically how they and their fellowship are fulfilling the scriptural mandate to “Bear ye one another’s burdens, and so fulfil the law of Christ” (Galatians:6:2). I want to present a list of practices that deviate from the biblical way and have been implemented as an aid to facilitate in counseling. Some miss the mark by miles, while others introduce subtle errors that nevertheless can contribute to serious problems. My list is hardly exhaustive and simply represents what I have observed personally, what I know biblically, as well as the extensive studies from psychological researchers supplied by Dr. Martin and Deidre Bobgan in their many volumes addressing the biblical way versus psychotherapeutic concepts and methods. The most obvious counseling error is for a church to refer a believer to a professional counselor, be it a clinical psychologist, marriage and family counselor, or a psychiatrist who practices psychotherapy. Psychotherapy, if you are not aware, does not deal with medical issues ; rather it is “talk” therapy drawn from some of the more than 500 concepts that professional counselors employ. We, and others, have written extensively about the anti-biblical theories and the pseudoscience of psychological counseling, which can be found in our website resource materials and in the book and DVD Psychology and the Church: Critical Questions, Crucial Answers . Yet here, in brief, are our fundamental problems with referring believers to those trained in psychological counseling: 1) The basic concepts were conjured up by those who were atheists and anti-Christians. Scripture tells us in Psalm 1 that believers are not to walk in the counsel of the ungodly. 2) The foundational belief of psychological counseling is that mankind is inherently good. Jeremiah:17:9 states the opposite. 3) It is an intimidating myth that psychological counseling is scientific and that only professionals are equipped to counsel. 4) Since nearly all issues related to counseling are symptoms of sin, psychological counselors have no basis for addressing sin. 5) All Christian psychologists attempt to integrate psychotherapeutic concepts with the teachings of Scripture. 6) Referring believers to professional counselors is a shameful denial of the authority and sufficiency of God’s Word. It is a matter of shepherds turning their flock over to hirelings at best—wolves in disguise at worst. Some churches that recognize the problems with referring their members out to professional counselors have one or more professional or trained counselors on staff. That approach solves nothing. It simply brings the inherent problems of psychological counseling under the roof of the church. The fellowship is still being subjected to professionals trained in psychological counseling and who counsel psychologically or attempt to integrate their professional training with biblical teaching, which always corrupts God’s Word. The method of setting up an individual as the counselor (e.g., an academically degreed professional or a certificated biblical counselor) for a fellowship is foreign to New Testament ministry. Moreover, it undermines body ministry within a fellowship as a function of the members rather than a particular individual. Too often it mimics methodologies of professional counseling that feature procedures that are contrary to what the Bible teaches. What then does the Bible teach about how believers in a fellowship are to go about ministering to one another? How are believers to deal with everyday issues that adversely affect their walk with the Lord and consequently their relationship with others? First of all, ministry is required of all the believers in a fellowship. Scripture does not say that only a select individual is to “bear another’s burdens.” It says “ye,” a plural form of “you,” meaning all are to be involved in ministering to fellow believers. Every true believer is indwelt with Jesus, who is our Counselor, and the Holy Spirit, who is our comforter and teacher. Even as a babe in Christ, a believer can be used in ministering. Furthermore, every believer has a gift or gifts of the Holy Spirit that he is to utilize for the building up and edification of the body of Christ. 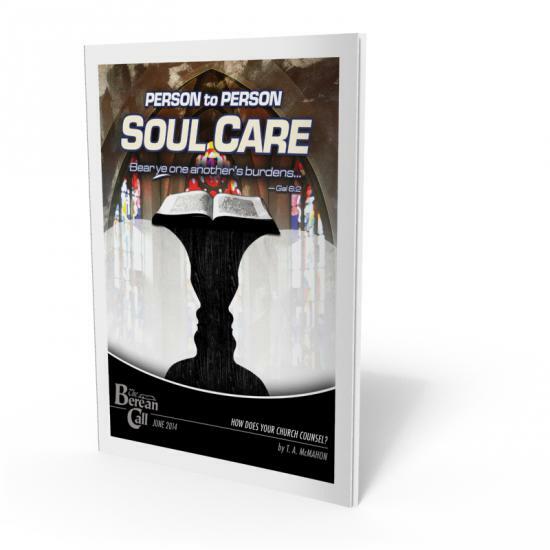 These gifts are essential to effective ministry. Since the gifts are a function of the Holy Spirit as He wills, their implementation is not dependent upon the maturity of the believer. Nevertheless, when it comes to someone who has walked with the Lord for many years, who has experienced His deliverance through trials and tribulations, who knows and has obeyed the instructions of His Word, the Holy Spirit certainly has much to draw upon in using that person to minister to other believers. 1) If counseling in a church becomes the function of an individual or a select few, that procedure rejects the biblical instruction that all should be involved in ministering to one another. It also puts a tremendous burden on the counselor (pastor or trained biblical counselor), and it erroneously sets that individual up as the one to go to in order to have life’s problems solved. As you may have perceived in this list, all are compatible with professional psychological counseling and are contrary to God’s instructions for believers to minister to one another. They are also rife with problems, according to studies by research psychologists themselves. Counseling by appointments of usually an hourly duration for a fee turns the counselor into a “paid friend.” Friendships “outside the office” between counselor and counselee are considered a breach of professional ethics. Counseling between males and females has often led to sexual involvement. Delving into the past is a Freudian concept known as “psychic determinism,” which has led to the inducing of destructive beliefs, such as the creation of false memories. “Unloading,” or “venting,” has been shown to be more emotionally damaging than holding something within. Denigrating a spouse or someone in a relationship “gone bad” greatly inhibits reconciliation. Transparency is nearly always selective, lacks honesty, and is biased in favor of the counselee. Obviously, if such concepts don’t work for secular counselors, they won’t work for “biblical” counselors. Pragmatism, however, is not the standard for a follower of Christ. Doing things His way is. TBC Notes - Keeping Your Soil Fertile?